The global market for angiography devices is highly competitive in nature with a large number of players operating in it across the globe, states a new research report published by Transparency Market Research. The expansion of the product portfolio and the rising research and development activities are the key factors that are projected to enhance the growth of the level of competition in the next few years. Some of the key players operating in the angiography devices market across the globe are AngioDynamics, Medtronic Inc., GE Healthcare, Merit Medical Systems, Siemens Healthcare, Shimadzu Corporation, Koninklijke Philips N.V., Boston Scientific Corporation, Canon Medical Systems Corporation, and Cordis Corporation. Furthermore, the rapid development of the healthcare systems and the innovations in this field are some of the other major factors that are projected to encourage the growth of the overall market throughout the forecast period. According to the market research study by Transparency Market Research, the global market for angiography devices is estimated to reach a value of US$33,370.3 mn by the end of 2025. The market is likely to register a healthy 4.30% CAGR between 2017 and 2025. The global market for angiography devices has been classified on the basis of geography into the Middle East and Africa, North America, Latin America, Europe, and Asia Pacific. In the last few years, North America accounted for a large share of the market and is estimated to remain in the similar position in the next few years. The presence of several leading players and the advanced healthcare facilities are the key factors that are projected to accelerate the growth of the North America in the next few years. On the other hand, Asia Pacific is predicted to register a healthy growth rate in the coming few years. The rising consumer awareness and the increasing disposable income are projected to accelerate the growth of this region in the near future. The global angiography devices market has been bifurcated on the basis of technology into CT, X-ray, MRI, and others. The X-ray segment is projected to experience a healthy growth rate in the next few years and is likely to remain in the leading position in the near future. The rising demand for flat-panel digital detectors is one of the key factors predicted to enhance the growth of the X-ray segment throughout the forecast period. On the other hand, the MRI and CT segments are anticipated to witness a healthy growth, thanks to their non-invasive nature of performing the angiography. The rise in the aging population and the increasing incidence of CVD are the major factors encouraging the growth of the angiography devices market in the next few years. The rising number of awareness programs and increasing funding activities and the growing focus on technological advancements are some of the key factors that are estimated to accelerate the growth of the overall market throughout the forecast period. On the flip side, the risk of radiation exposure and the limitations in the reimbursement for the angiography procedure are projected to restrict the growth of the market in the near future. 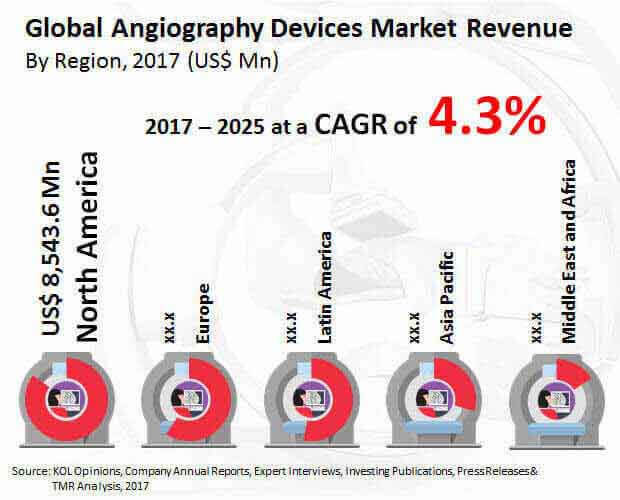 Nonetheless, the developing economies hold immense growth potential, which is likely to accelerate the growth of the global angiography devices market in the next few years. The rising number of programs conducted for the awareness among consumers is predicted to encourage the growth of the angiography devices market in the near future. Growing focus on innovations and advancements to offer potential growth opportunities for market players in the next few years.